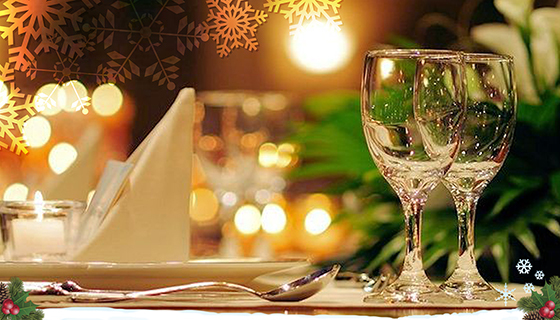 Carolina restaurant is hosting a Christmas Eve Dinner on December 24th for US$140 per adult and US$70 for kids. Or, on Christmas Day you can enjoy a special Christmas menu at their Las Marietas restaurants for US$45 per child and US$110 per adult. New Year’s Eve is a similar proposition at Carolina’s where they will host a special dinner for US$250. Ask about the “Barefoot & Beautiful” party! Christmas Eve means an excellent buffet dinner served on the hotel’s beach at a cost of MXN$700 per person. On the last day of 2016 they’ve prepared a New Year’s Eve Dinner Dance for MXN$1,880. Besides offering special rates on their All-Inclusive single, double or triple rooms, the resort will host a New Year’s Eve Gala Dinner for MXN$1,400 per person. Welcome the New Year at the hotel’s spectacular Venetian Carnival with fireworks, period costumes, dinner and entertainment in the garden across the hotel’s beach. Cost is MXN$700 for adults and teens and MXN$450 for children 12 and under. The Christmas Dinner includes a buffet, drinks, live music and a sparkly toast. Cost for adults is MXN$499 and MXN$349 for minors. Their New Year’s Eve dinner is also a buffet priced at MXN$549 for adults and $MXN449 for minors. The beach at The Grand Bliss will be the site of the four-course Grand Christmas Dinner with live music; cost is MXN$960 for adults, MXN$490 for children ages 6-12 and MXN$300 for children under six. The Grand Rumba New Year’s Party 2017 with gala menu and live music will be held in the same place and there will be several different family packages for guests to choose from. Hotel guests will be able to enjoy themselves in the company of their loved ones at an exquisite buffet dinner (for an additional cost apart from the nightly rate) both on Christmas Eve and New Year’s Eve, the latter will take place during the celebration of the Venetian Carnival. To celebrate Christmas the resort has prepared a special menu for MXN$999 per adult and MXN$300 per child. New Year’s Eve will be a dinner plus the traditional toast and good-luck grapes for MXN$1,750 per adult and MXN$500 per child. Christmas Eve Dinner will be at Tukipa, with six courses of the guest's choosing paired with house cocktails and wine at a cost of US$140 per adult and US$60 per child. On Christmas Day both restaurants will offer a delicious brunch. New Year’s Eve will bring the “Stations of the World” to the oceanfront Tzamaika with dishes from Italy, France, Argentina and, of course, Mexico, plus music and drinks for US$230 per adult and US$90 per child.